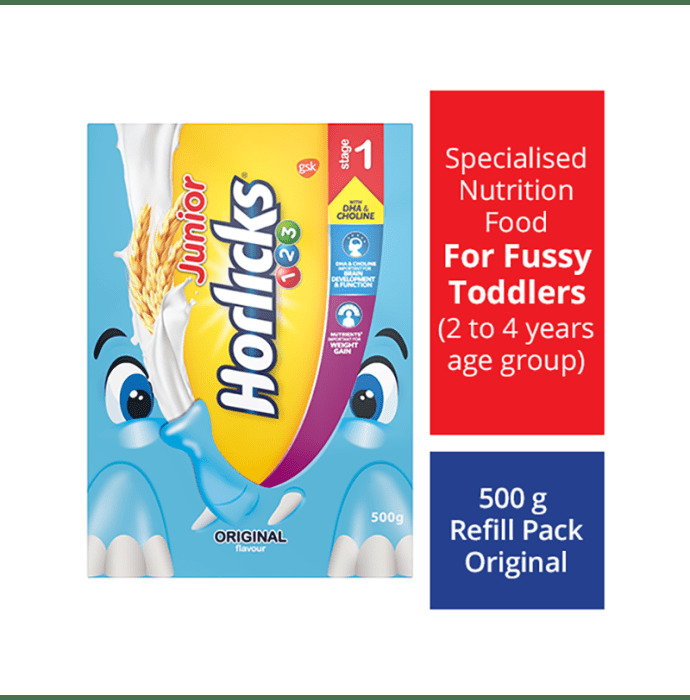 Horlicks Junior Stage 1 powder is designed to provide age-appropriate nutrition for the child. It helps fussy toddlers by providing nutrients that help in weight gain. DHA and Choline ensure healthy brain development. It is easy to digest, allowing kids to consume it comfortably. Milk Calcium and high protein are very important for bone growth in nursery going children. 3 heaped teaspoonfuls (30 gm) of Horlicks Junior. Add a little hot milk stirred in slowly to make a thick paste. Topped up with hot or cold milk, stirring to remove lumps. Add little sugar if required. Recommended serving is 2 serves (60 gm) per day. 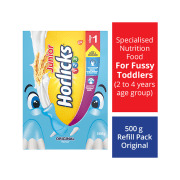 A licensed pharmacy from your nearest location will deliver Horlicks Junior Stage 1 Refill Pack Powder Original. Once the pharmacy accepts your order, the details of the pharmacy will be shared with you. Acceptance of your order is based on the validity of your prescription and the availability of this medicine.